INTRODUCING THE ALL NEW SPORTSMAN DATA RECORDER FROM RACEPAK! 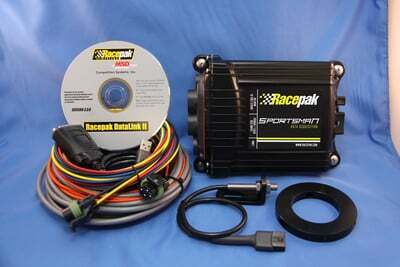 THIS NEW DATA ACQUISITION SYSTEM IS DESIGNED TO MEET ALL OF THE NEEDS OF THE SPORTSMAN RACER, INCLUDING THEIR BUDGET. THIS COMPACT RECORDER PROVIDES UP TO 21 CHANNELS OF DATA. THE NEW SPORTSMAN SERIES INCORPORATES THE SAME V NET TECHNOLOGY USED BY THE PROFESSIONALS, BUT IN THE ECONOMICALLY PROCED PACKAGE. IN IT'S BASE CONFIGURATION, YOU CAN RECORD AND DOWNLOAD ENGINE AND DRIVESHAFT RPM, BATTERY VOLTAGE, ACCELERATION G'S AND LATERAL G'S. AFTER A PASS, SIMPLY PULL THE SD MEMORY CARD OUT, AND OPEN THE INFORMATION ON YOUR PC USING RACEPAK'S DATALINK SOFTWARE, NO CABLES REQUIRED. YOU'LL BE ABLE TO SEE HOW YOUR ENGINE AND CAR PERFORM ON THE STRIP, AND USE THAT KNOWLEDGE TO HELP YOU WIN!